Before you plan on having ghost hunters come to your home, you might want to consider the following story about “Monkey Ghost House”. I have been planning to move to a nearby town. I currently live out in the country, and after 20 years it’s time for me to move to where I can have pizza delivery. Keene is the nearest “big town”. I’d been looking at homes trying to narrow down the right neighborhood, when I found a lovely older home near downtown last year. I was very interested. High ceilings, stained glass, easy walking to the library and restaurants made this a tempting property. I toured the home, which was being used as a rental, and noticed a few odd things. The basement had a huge cage. It seemed to be big enough to serve as a drunk tank lock up. There were ropes hanging there. I looked at the agent showing me around and he said “Well, the previous owners had a monkey as a pet.” A monkey that needed to be locked up. 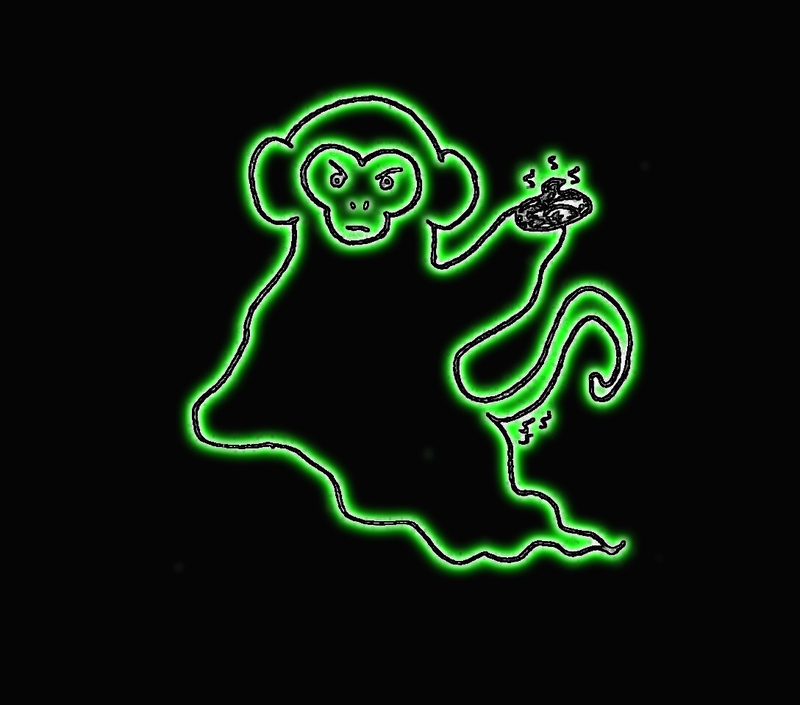 Monkey ghost, with ecotoplasm pooh! I considered putting in an offer on the home, but as I always do before buying a house I stopped to talk to the current renters and the neighbors. What I found was either a big joke, or one of the more interesting ghosts I’ve ever heard about. One neighbor shook his head at me and said “You really don’t want to buy the house, it’s haunted.” I laughed, I assured him I was a skeptic and if I did discover proof of a ghost I knew where I could get a million dollars. (The JREF Million Dollar Challenge). Shock kept me from laughing, I could tell this man was serious. That or he was awfully good at keeping a straight face. He then went into detail, for one thing you never touch the monkey’s toys in the garage (I remembered how upset the real estate agent was when I tried). The monkey didn’t like “his stuff” moved. People tripped on the stairs and they felt their hair being pulled. Above all else, there was the smell. The monkey, in death as well as in life, threw pooh. I talked with one of the renters. She backed up the story, the details matched up with the neighbors story. She wasn’t afraid of the monkey ghost, simply it was embarrassing to have company over with monkey poop flying through the air. I asked the renter if she would allow me to investigate the house. She would only accept if I promised to “Get rid of the damn monkey.” I broke it to her that I had never found evidence for a ghost, human or monkey, and even if I had I would have no clue how to “get rid” of it. She decided to live with the monkey ghost a bit longer as her lease was up soon. or had no moral standards..
I’d be raking in the monkey ghost money! I went to the real estate agent to point out that while I did not believe in ghosts I wasn’t sure I wanted to buy a home with a story about a monkey pooh flinging ghost attached to it. The agent was quite upset, and told me “We aren’t required to disclose if a home is haunted or not.” The problem for me wasn’t the ghost, it was the ghost story. The house dropped in price more than would be expected in this not friendly real estate market. It finally sold for far less than other homes for sale on the block did. My guess, is maybe more than one buyer was scared off by the monkey ghost reputation. Regular ghosts are bad enough, but monkey ghosts throwing ghostly pooh, who wants to chance that? I have to admit, I would have bought the house if I thought there was any chance of there really being a monkey ghost. Sadly, my skeptic background assured me that definitive proof of even human ghosts, to say nothing of monkeys, has not been found. I can’t tell you how I would enjoy hosting a skeptic meeting in my haunted home. Monkey pooh would fly, hair would be pulled, and people would trip over invisible monkey toys left on stairs. I can tell you how I would hate living in a home with only a story of a monkey ghost, and try to sell it down the road when I am ready to move again. Especially if in the story the monkey throws very smelly ghostly pooh. The house finally sold, and I can only hope the new owners cleaned up the cage in the basement, got rid of the monkey play house and threw out the toys. They may also have figured out what was making that horrible smell every now and again. I’m thinking the sewer line needed to be checked out. 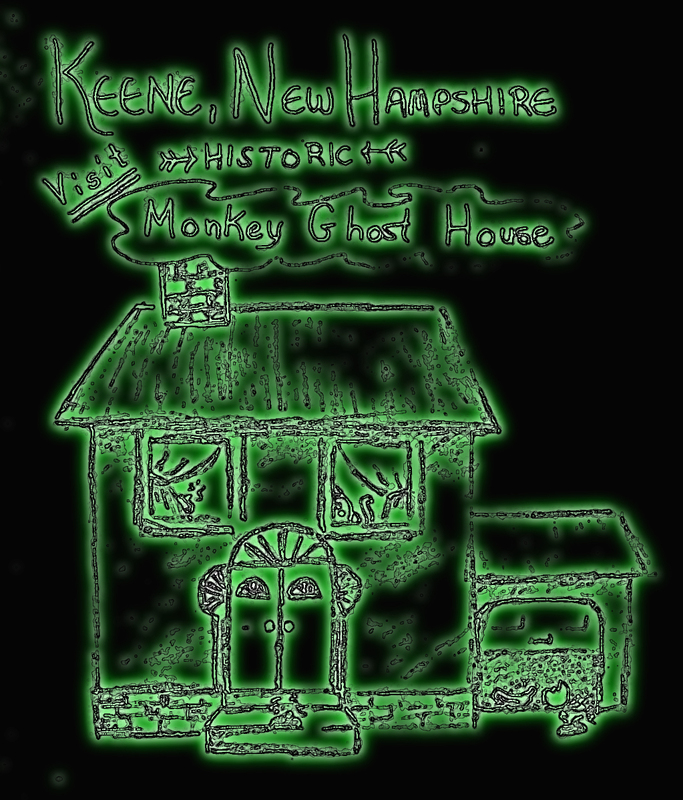 If the house can eventually lose the reputation as the “Monkey Ghost House” remains to be seen. Tempting as it was to live in “Monkey Ghost House”, economics and resale value eventually won out, and I am still looking for a home in town.